These stainless braided brake flexi-pipes are a direct replacement for the rubber originals. Not only do they have a much greater life expectancy than the rubber pipes but also eliminate spongy pedal feel and improve brake response as they do not "balloon" under pressure like the rubber originals. 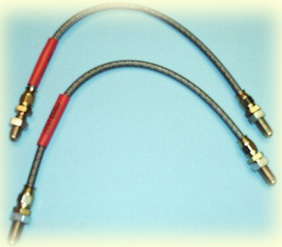 Manufactured from TFE stainless steel wire braid with cadmium plated end fittings. 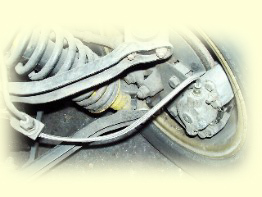 Conventional brake hoses, manufactured in rubber with textile reinforcement, are permitted to have a significant amount of volumetric expansion, that is they swell under pressure, this leads to a soft feel to the brake pedal, acceptable in a road vehicle but not for competition. On racing vehicles, this has lead to the universal usage of smooth bore PTFE (Teflon ® ) hose with normally a stainless steel. This hose has the added benefit of lightness, strength, high temperature resistance and protection from stone damage. We call it " Moquip TFE ", Aeroquip " TFE racing hose " or " 2807", Aeroquip Aerospace " 666 ", other brand names are " Speed-Flex ", 600 ", and " 411 ". They can be had with re-useable or swaged on fittings. With the exception of Aeroquip Aerospace, hose and fittings are interchangeable between brands. Some countries, not the UK, insist on tests for brake hoses. The TFE hose assembly passes all the tests except the whiplash test which ensures that the hose is suitable for withstanding large wheel movements on vehicles doing hundreds of thousands of miles, quite sensible, but not relevant to competition motoring. Some hose specialists have recently come up with complicated assemblies allowing the hoses to pass the test, but generally speaking, they are not suitable for high mileage road usage. These hoses are also suitable for oil pressure gauge lines, fuel injection pipes, power steering hoses and, because of their high temperature capabilities, on turbocharger oil feed and return lines. Sizes. Available from -3 to -16 but only -3,-4,-6 and -8 are relevant to vehicle applications. -3 is used for brake hose applications, -4 for clutch due to greater fluid transfer requirements and for turbocharger feeds, -6 & -8 for power steering and turbocharger drains.